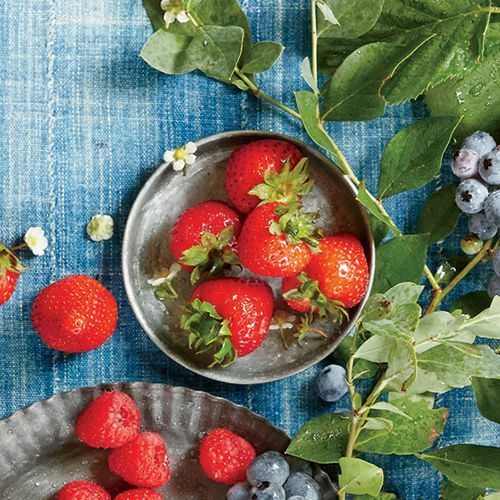 Choosing: Look for plump berries that are dark blue with a light blue frosting. Green or pink berries are not ripe, except for the pink varieties. Many farms market their berries to customers who enjoy picking their own, so you can also look for U-pick operations in your area. Storing: Do not wash blueberries before storing them. Place them in a plastic or perforated produce bag in the vegetable bin of your refrigerator. They will be good for 7 to 10 days. Growing:Blueberries thrive in acidic soil that's loose, well drained, and rich in organic matter such as compost. They also need a full-sun location. 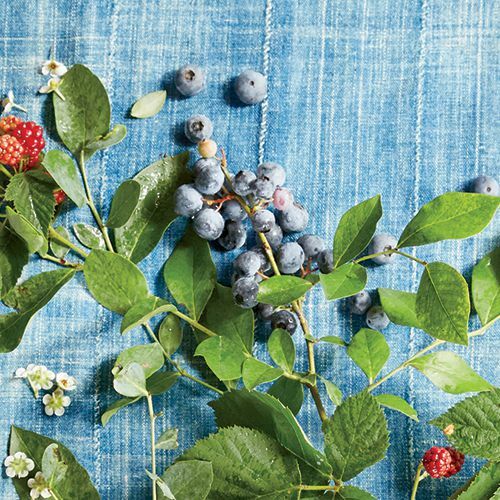 For berry picking all summer, plant early, mid-, and late- season varieties for continual harvest. The Perfect Recipe: Blueberries are the standout ingredient for the sweet and sour sauce that accompanies these Lemon-Herb Chicken Skewers. 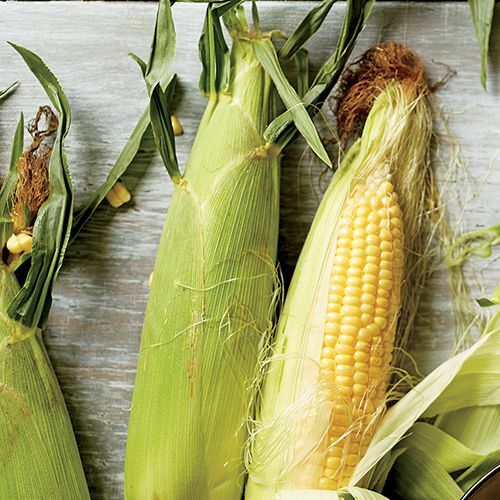 Choosing: Look for green, moist husks that cling tightly to the corn. Storing: If you can't eat the corn immediately, store it in the refrigerator with the husks intact, and eat within two days of purchasing for the best taste. Don't shuck until you're ready to use. The Perfect Recipe: Add a hit of flavor to your taco night with charred corn. We especially love this Mushroom and Charred Corn Tacos with Guacamole recipe. 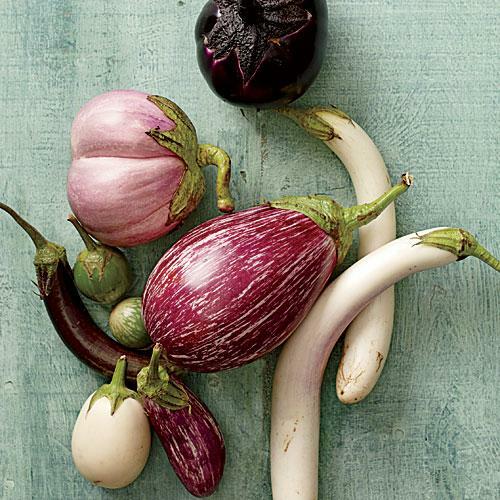 Choosing: When selecting, look for eggplants with firm, glossy skin. Size and color vary widely among types, but the eggplant should feel heavy. Avoid those with wrinkled skin, soft spots, or brown patches. Storing: Store whole, unwashed eggplants in a produce bag to retain moisture and prevent shriveling and keep eggplant in your vegetable bin or the warmest section of your refrigerator. Planting: No matter which variety you choose, plant in the spring after the soil and air have warmed. Make up for the lost time by starting with transplants, even if you grow them yourself indoors. The Perfect Recipe: Go above and beyond the average eggplant recipe with this gorgeous and flavorful Charred Eggplant with Chermoula recipe. Season: Summer and fall are peak times for peppers. Choosing: Look for peppers that are wrinkle-free, glossy, and free of injuries. Storing: Place peppers in a produce bag, and store in the vegetable bin of your refrigerator. They'll last about a week. 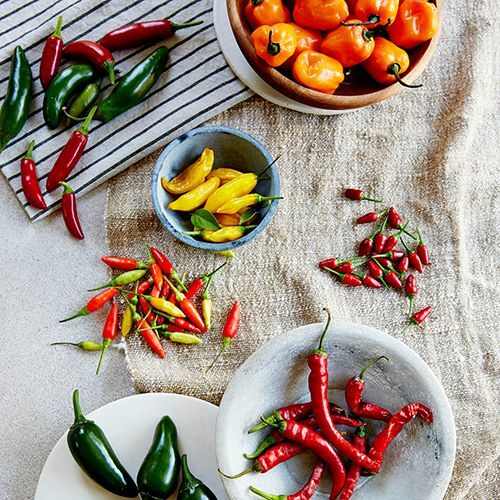 How to Tame Hot Peppers: For a milder taste, learn how to tone down the heat with our easy technique. The Perfect Recipe: Salty bacon, rich goat cheese, savory-sweet jelly, and roasted jalapeño unite in these perfect little Jalapeño Poppers. 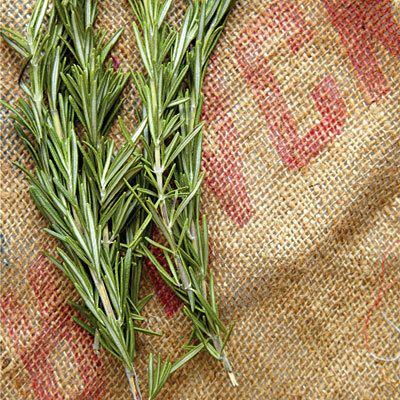 See More: How to Store Herbs. Choosing: Sold in little bundles of stems with the small leaves attached, thyme should appear fresh, not wilted. It is normal for some types to be gray, but yellowed or shedding leaves indicate the bunch is past its prime. 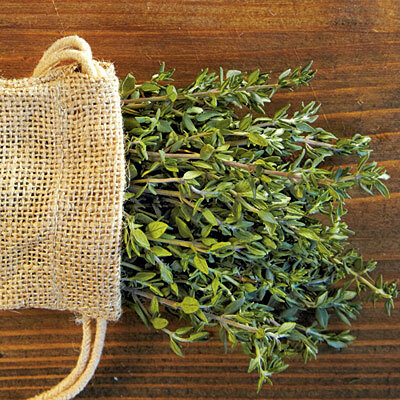 Storing: Place freshly cut thyme in a plastic produce bag in the refrigerator, preferably not in the vegetable bin. The Perfect Recipe: Whether used by the pinch or by the bunch, fresh thyme infuses any dish with unparalleled aroma and flavor, like in this Roasted Salmon with Thyme and Honey-Mustard Glaze recipe that surprises your taste buds and satisfies in every bite. 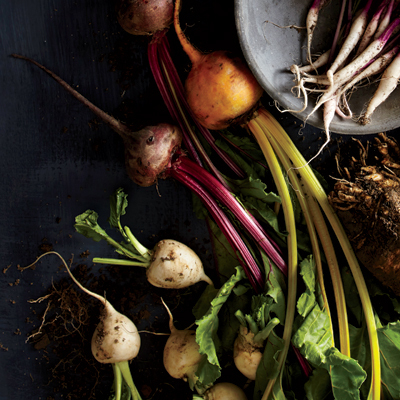 Season: Beets prefer the cool weather of spring and fall—June to November. The Perfect Pairing*: This Heirloom Tomato and Beet Salad is a showstopping way to highlight the vegetable's natural beauty. Storing: Once picked, cucumbers lose moisture, which is why supermarket cukes are waxed or individually wrapped in plastic. Keep garden-fresh cucumbers crisp by placing them in a produce bag in the vegetable bin of your refrigerator. They'll hold for about a week. Planting: Plant cucumber seeds or transplants in spring no sooner than two weeks after the last frost. The air should be warm, but it is also a good idea to give the soil time to lose that winter chill. 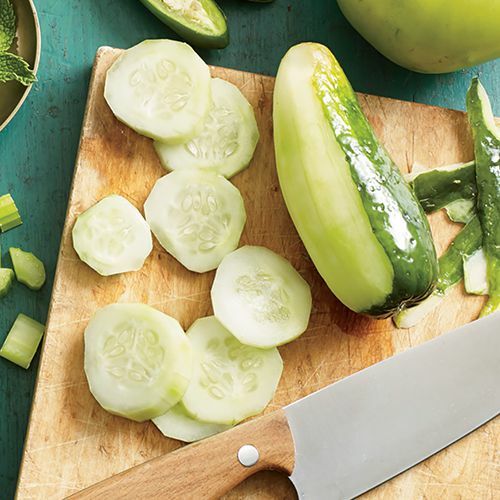 The Perfect Recipe: Cucumbers are just one of the season's peak favorites in this Summer Crunch Veggie Salad recipe, which also includes scallions, red bell pepper, corn, fresh basil, and chopped romaine. Top with Simply Dressed® Ranch Dressing, made with simple ingredients for the same great taste. Choosing: Basil is delicate and bruises easily, so look for stems that aren't wilted and don't have dark spots. The ideal would be basil stems that don't have a flower bud or have just a small one. Avoid those with long flower stalks and seeds. Storing: Place fresh basil in a vase of water on your kitchen counter—after giving the stem a fresh cut—for up to a week. Be sure to change the water every few days. If it's wilted, place a produce bag loosely over it until it revives. Do not cut or pinch leaves from the stems until you are ready to use them. 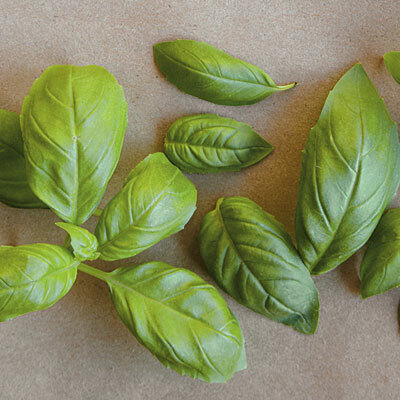 The Perfect Recipe: Fresh basil is the ultimate flavor booster in fresh salads. Here, it unites with pizza dough, fresh tomatoes, and mozzarella cheese to create a better-than-takeout White Pizza with Tomato and Basil. Storing: Place cauliflower in a produce bag in the coldest part of your refrigerator, where it should last for 4 to 7 days. 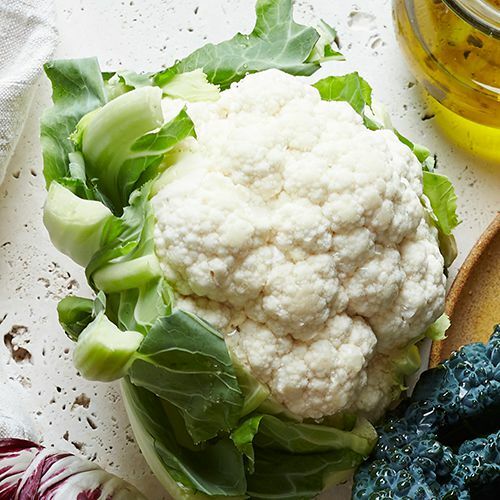 Health Benefits: Packed with vitamin C, we love cauliflower for its potential cancer-fighting properties and—of course—its taste. The Perfect Recipe: No "knead" for bread—this Cheesy Cauliflower Crust has half the carbs and double the fiber of traditional pizza dough. 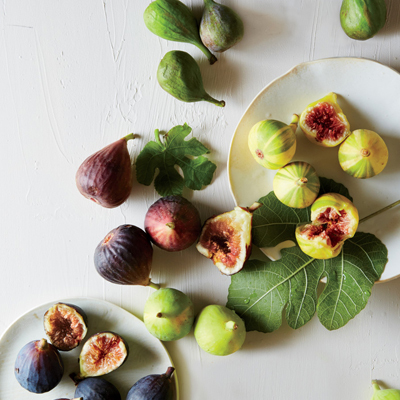 Choosing: The ideal fig is one that has a bend at the stem, showing that it curled downward on the tree from its own weight. The Perfect Recipe: Fresh figs lend a sublime sweetness in this stunning galette. Choosing: Bunches of feathery dill foliage, also called dill weed, should be bright green and fragrant with no signs of wilting. 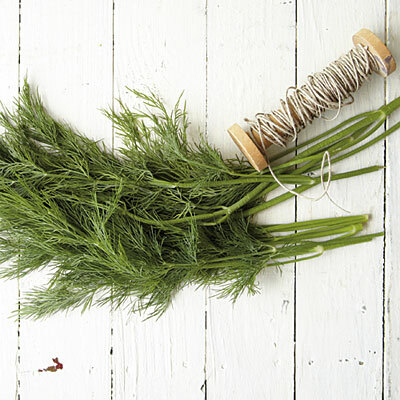 Dill can look a lot like the darker, glossier fennel foliage, so check carefully to be sure which one you're buying. Storing: Wrap fresh dill in a moist paper towel, and place it in a plastic produce bag in the vegetable bin of your refrigerator. The Perfect Recipe: Creamy Greek yogurt, fresh dill, and cooling cucumbers unite to make an incredible base for tangy Tzatziki Chicken Salad. 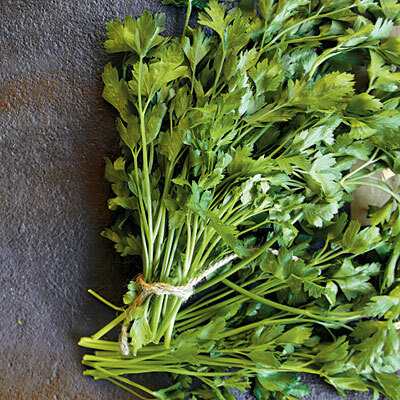 Choosing: Select a parsley bunch that's bright green and free of bruising, decay, and blemishes. Storing: To be sure parsley stays perky and hydrated during storage, cut half an inch off the ends of the stems using kitchen shears. Plunge the cut ends into a glass of water for about an hour; remove, and place the entire bunch in a plastic produce bag to prevent wilting and it will last about a week. The Perfect Recipe: If someone asked what the color green tastes like, chimichurri might very well be the answer. This classic condiment creates a bright, fresh, and tart sauce to amplify meat, fish, potatoes and so much more. Choosing: Look for fresh, green oregano that isn't bruised or wilted. Storing: Keep cut oregano in a plastic produce bag in the vegetable bin of your refrigerator, or store in the freezer. The Perfect Recipe: A staple of Italian-American cuisine, oregano can be used in a wide variety of dishes for a bold hit of flavor, like our no-fail Oregano and Lime Roasted Chicken Breasts recipe. 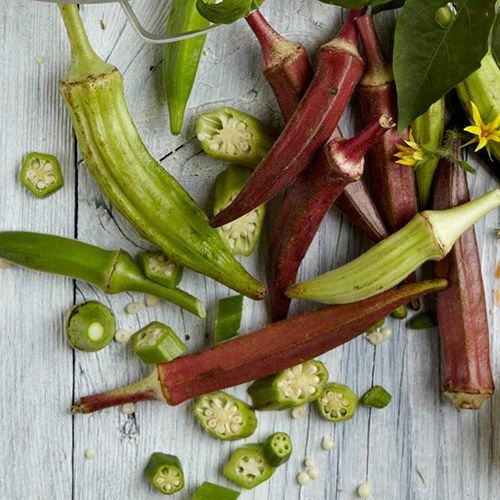 Perfect Recipe: Even folks who usually don't like okra enjoy the taste and texture of this Indian-Spiced Okra. 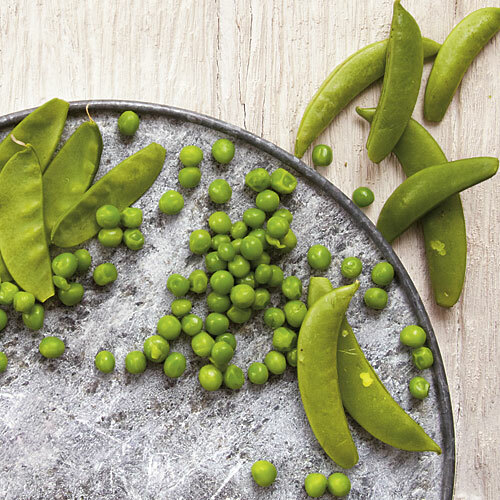 Choosing: Green peas for shelling should have green, glossy pods that feel firm and full. Snow pea pods should be flat with almost no visible lumps of peas inside. And edible-podded sugar snap peas should be crisp and plump. Storing: If you can't cook and eat them immediately, store peas in a produce bag in the vegetable bin of your refrigerator. All types should be refrigerated after you buy them because their sweetness declines quickly after picking. Wait to shell peas just before you cook them. Growing: Plant in the cool season of spring and fall in most of the country. In northern or high-altitude areas with cool summers, they can be picked all summer. Perfect Recipe: Ready in just 12 minutes, Sauteed Sugar Snap Peas with Chile, Lemon, and Mint is a recipe you'll want to return to time and time again this season. Season: Arugula prefers cool weather, usually the refreshing days of spring and fall. Choosing: Look for unblemished green leaves with no sign of yellowing or wilting. Storing: If you buy arugula, keep it from wilting by placing it in a produce bag in the refrigerator. It will last about a week. 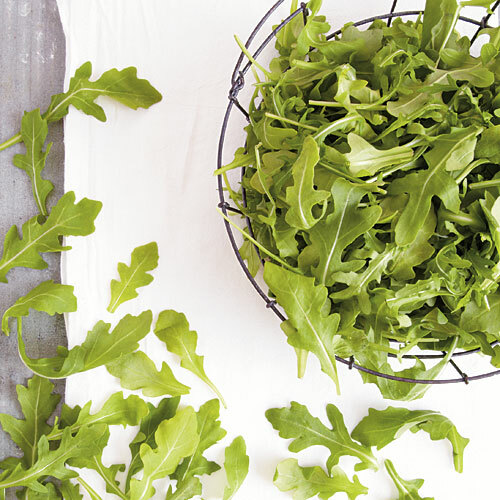 When growing arugula, the best way to keep it fresh is to leave it in the garden until you need it. Growing: Arugula is mild-mannered when young but becomes downright spicy as the plant matures or the weather gets warm. No matter which variety you choose, plant in the spring after the soil and air have warmed. Make up for the lost time by starting with transplants, even if you grow them yourself indoors. The Perfect Recipe: Mason jar salads are an easy, healthy, and delicious portable lunch solution. Use arugula as a layer in this Quinoa and Edamame version, plus Marzetti Simply Dressed® Balsamic Salad Dressing to give veggies and grains a tangy flavor boost. Choosing: Look for smooth, blemish-free squashes. A small, tender squash is preferable to an oversized, seedy one. Storing: Place squash in a produce bag in the vegetable bin of the refrigerator for up to a week. 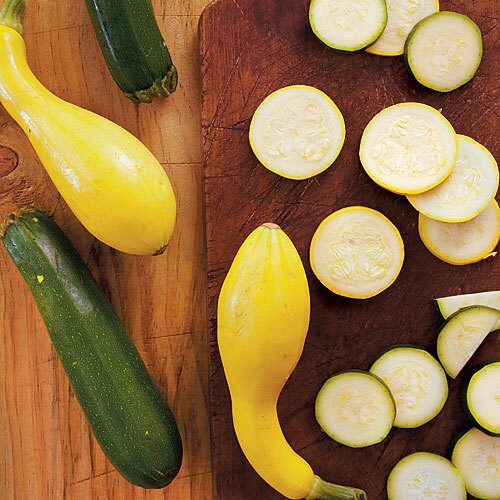 Growing: The basic summer squashes are yellow (crookneck or straightneck), zucchini (green or yellow, long or round), and pattypan (scallop). The plants are similar, growing like a large shrub with fuzzy leaves that make your arms itch. Perfect Recipe: Gorgeous in presentation and taste, it's hard to believe this decadent Summer Squash, Bacon, and Mozzarella Quiche is less than 300 calories per serving. Choosing: Zucchini can be striped, green, yellow, or white, but always look for a vibrant, healthy color. If the stem is still attatched, the produce will last longer. Storing: Store fresh zucchini in a paper bag in the refridgerator for up to on week. Avoid storing zucchini in plastic produce bags, because they trap moisture and give zucchini a slimy exterior. 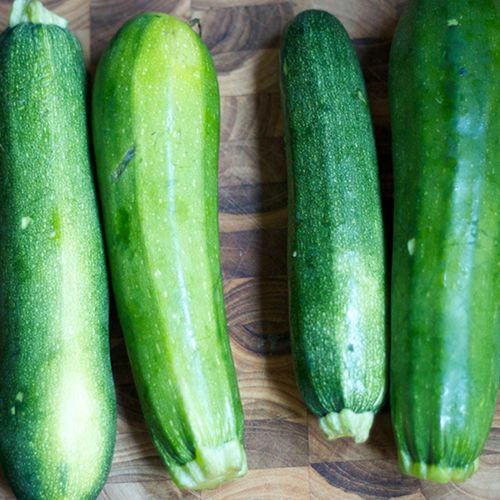 Growing: The vine varieties of zucchini are considered winter squash, while vine varieties are considered summer squash, which means that zucchini plants can be grown year round. Perfect Recipe: No-cook veggies make this easy Summer Veggie Pasta a weeknight favorite. Peeling zucchini and squash into ribbons makes them fun for kids. Choosing: Choose apricots that are firm to touch, plump in appearance and possess a rich orange colour. Storing: Store unripened apricots in a paper bag until they have softened, which usually takes about 2-3 days. Growing: Apricot trees bloom early in the spring and have a limited tolerance of high summer heat. Perfect Recipe: A sprinkling of fresh, fragrant thyme leaves over ripe apricots helps make this Apricot-Thyme Galette really shine. 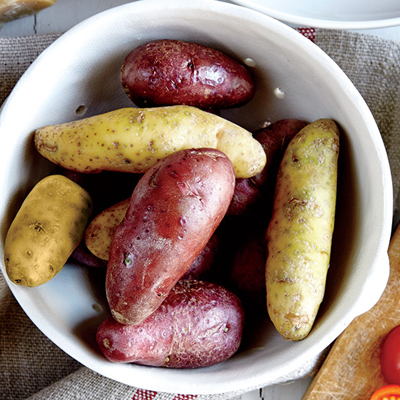 Storing: Store them at room temperature but not in direct sunlight—the kitchen windowsill may not be the best spot. Never store tomatoes in the refrigerator. How to Slice and Seed: Remove the core. Holding the tomato with the core side up, cut the tomato crosswise. Using the tip of a knife, remove and discard the seeds from each tomato half. The Perfect Recipe: Make these Bacon Blue Cheese Salad Skewers your go-to summer appetizer! Simply thread cherry tomatoes, cucumbers, and lettuce onto bamboo skewers drizzle with Simply Dressed® Blue Cheese Dressing and top with savory bacon crumbles. Choosing: If you are shopping at a farmers' market, you can usually taste a berry before you buy. They should be sweet and plump, without any redness. Storing: If you don't eat all the berries on your way home from the market, cover them loosely by placing the container in a produce bag without sealing it. Keep them in the refrigerator, and try to use them within a few days. Growing: Blackberries need full sun, rich soil, and good drainage; a trellis or hedgerow area is also helpful for easier management. 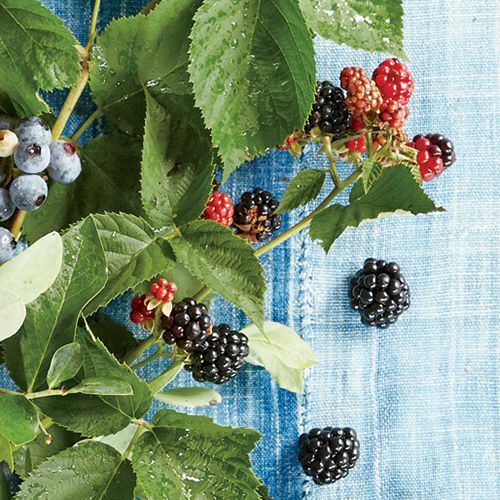 Properly managed, a blackberry plant can provide 10 to 15 pounds of berries. Perfect Recipe: Blackberries are a delightful addition to so many summer dishes, but make them the focus in summer drinks as well like this Fresh Blackberry Granita with Lemon Syrup. Choosing: Ripe cantaloupes will smell noticeably fruity at the site where the stem was attached. The other end will give slightly when pressed if the melon is ripe. Avoid melons with obvious cuts or bruises. Storing: Cantaloupes will continue to ripen if kept at room temperature. Once ripe, place them in the refrigerator for up to a week. They'll remain in good condition for up to a week in the refrigerator. Wrap any cut melon in plastic, and plan to use it within three days. Growing: Cantaloupes, honeydew melons, and watermelons all grow on vines that ramble around the garden, often requiring lots of room to stretch. 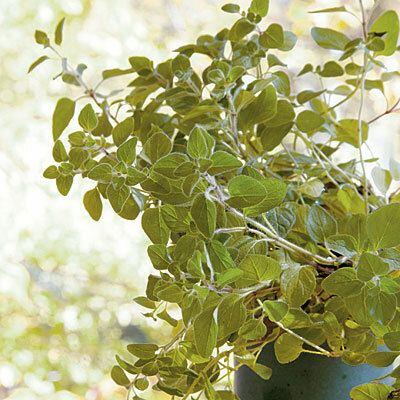 Some varieties are bush-type, having short vines that are more manageable in small spaces and in containers. Perfect Recipe: Melon Salad with Savory Granola brings a punch of sweetness and crunch to your picnic table. 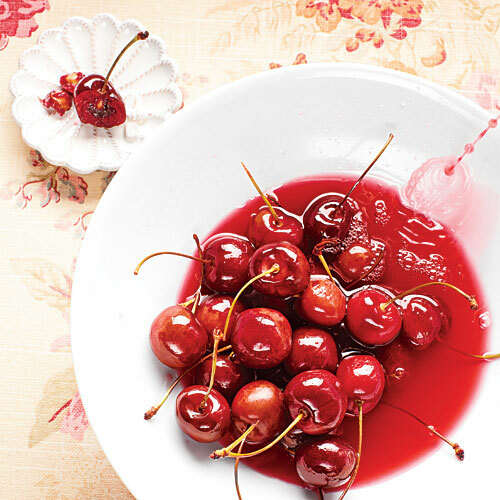 Choosing: Tart cherries are smaller, a little softer, and acidic rather than sweet. Sweet, deep-crimson Bing and peachy-colored Rainier are the most abundant varieties. Storing: Keep whole cherries, unwashed, in a breathable plastic bag in the refrigerator. Wash before serving, and eat them as soon as possible, as they can soften and deteriorate quickly. Growing: Cherry trees are small to medium-sized and thrive where summers are short and winter is long and consistently cold. Choose a location that receives full sun and is not a cold pocket where late-spring freezes will settle. Perfect Recipe: Don't miss out on this decadent Cherry-Hazelnut Cake with Streusel Topping this summer. You'll love how rich and satisfying it tastes without adding a ton of calories or sugar to your daily intake. Choosing: Choose firm, symmetrical, unblemished melons without cracks or soft spots. A ripe watermelon will have a hollow sound. 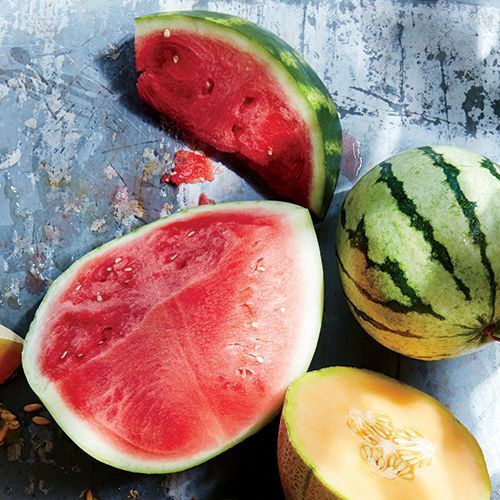 Storing: Store uncut watermelon at room temperature for up to one week. If serving it chilled, refrigerate for eight to 10 hours. Growing: Cantaloupes will continue to ripen if kept at room temperature. 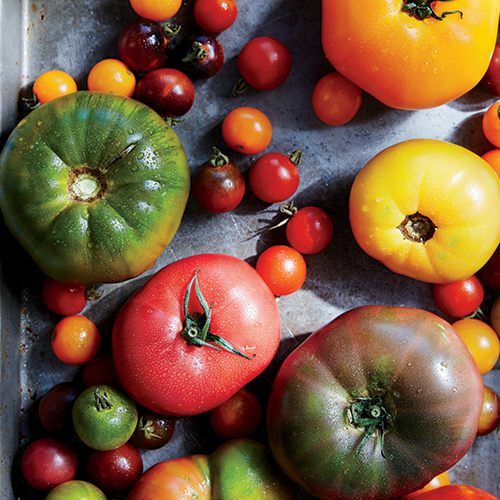 Once ripe, place them in the refrigerator for up to a week. They'll remain in good condition for up to a week in the refrigerator. 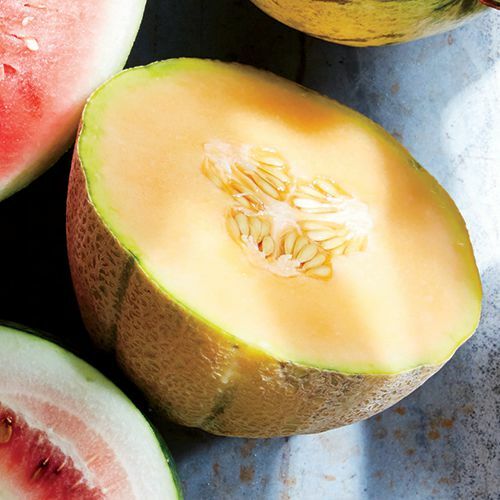 Wrap any cut melon in plastic, and plan to use it within three days. Perfect Recipe: This Watermelon Salad with Feta and Cucumber Pickles is a delightfully refreshing way to play off the fresh flavors of seasonal produce. Choosing: Honeydew melons will smell noticeably fruity at the site where the stem was attached. The other end will give slightly when pressed if the melon is ripe. Also, they'll sound hollow when thumped. Avoid melons with obvious cuts or bruises. Storing: Honeydew melons will continue to ripen if kept at room temperature. Once ripe, place them in the refrigerator for up to a week. They'll remain in good condition for up to a week in the refrigerator. 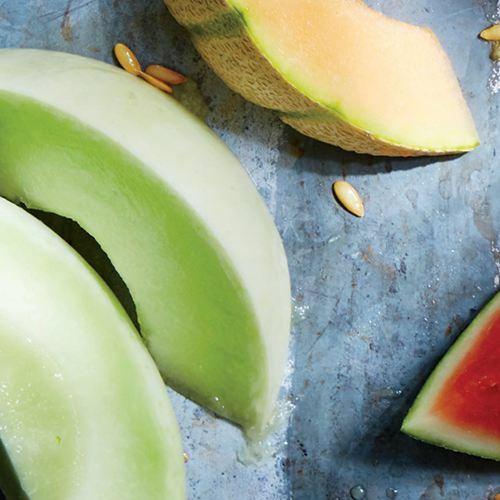 Wrap any cut melon in plastic, and plan to use it within three days. Perfect Recipe: So simple, yet elegant, this Shaved Melon Salad with Lemon-Sherry Dressing shines during the warmer months. 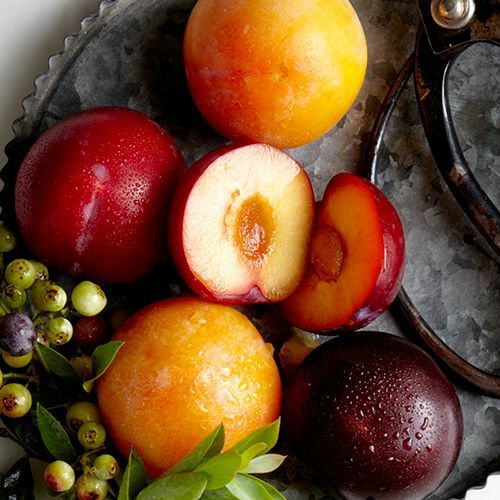 Choosing: Choose medium to large nectarines that are unbruised and have a rich color. Growing: Nectarine trees are self-fruitful. Trees should be planted in sunny locations and also thrive in warm areas that receive seasonal winter chill. 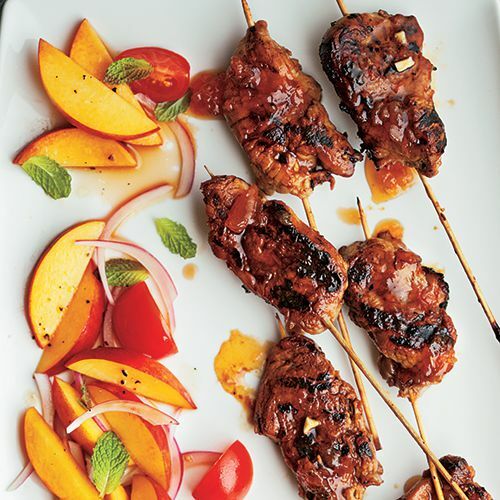 Perfect Recipe: This company-worthy Chicken Kebabs and Nectarine Salsa recipe blends spice from the chicken with sweet and tangy nectarine salsa. 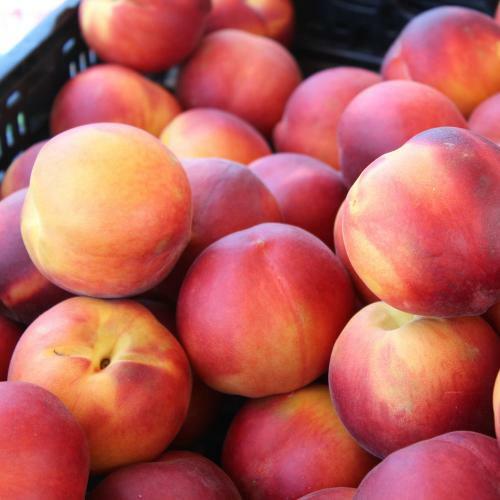 Choosing: Buying local is best, because peaches ripen so quickly. 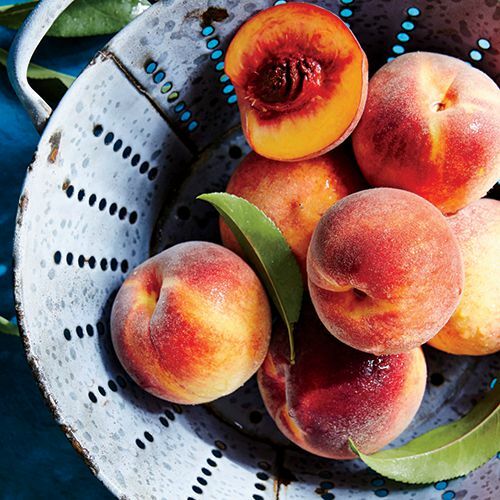 If the color behind the blush of pink is yellow (or white for white-fleshed peaches), the peaches are mature, will soften quickly, and be ripe and juicy in no time. Growing: Peach trees are a year-round project—with delicious rewards. Trees are reasonably small and self-fruitful. Choose the right variety for your area, one that needs about the same amount of winter chill that you get in an average season. Perfect Recipe: Favorite summer flavors combine for Peach and Basil Shortcake—a real peach of a dessert! Choosing: A perfect plum should feel heavy and slightly soft at the opposite end of the stem. Storing: Hard plums will ripen in a brown paper bag at room temperature within 2 to 3 days. Growing: Plum trees require full sun and well-drained, sandy soil in order to thrive. They tend to like warmer climates, because frost can damage the trees. Perfect Recipe: Perfectly portable and a great make-ahead dish, these Roasted Plum Breakfast Parfaits bring a slightly sweet finish to your meals. Season: Early summer through fall, depending on where the berries are grown. 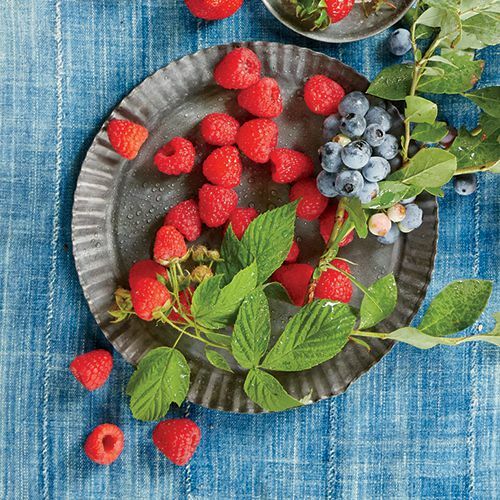 Choosing: Select berries that are firm without signs of juice stains or mold. Storing: Refrigerate unwashed berries as soon as you get them home. Use or freeze them within two days of purchase, rinsing them gently just before use. Harvesting: Pick raspberries in the morning when the berries are sweetest. A shallow basket lined with a clean paper towel is ideal. The berries are fragile and won't tolerate the weight of many berries on top of them. Perfect Recipe: Nothing beats the fresh flavor and sweetness of homemade preserves. Don't shy away from making your own and give this Fresh Raspberry-Vanilla Preserves a try this season. Season: Artichokes peak in spring and produce a second crop in fall. 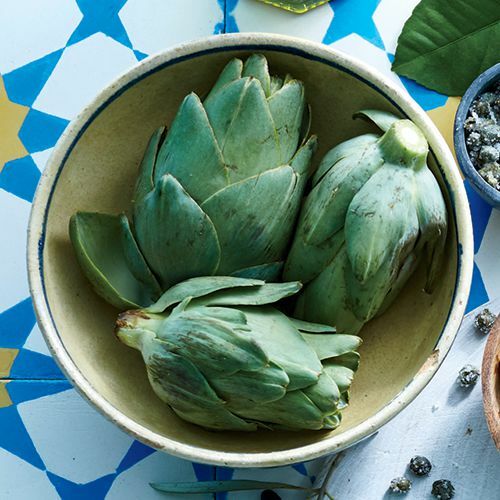 Storing: Store fresh artichokes in a produce bag in the refrigerator for one to two weeks. Growing: The ideal climate for perennial artichokes is coastal California, where winter is gentle and summer mornings are foggy and cool. Perfect Recipe: We love the artichokes in this Braised Artichokes, Favas, and Carrots in Creamy Lemon Sauce with Fennel dish—they add their unique flavor and somehow make everything taste just a little sweeter. Choosing: Look for fruit that is firm, yet gives when gently squeezed. Storing: You may refrigerate ripe avocados until you're ready to eat them, but only for a few days. Placing an avocado in a paper bag with an apple or banana and storing it at room temperature will accelerate the ripening process if needed. 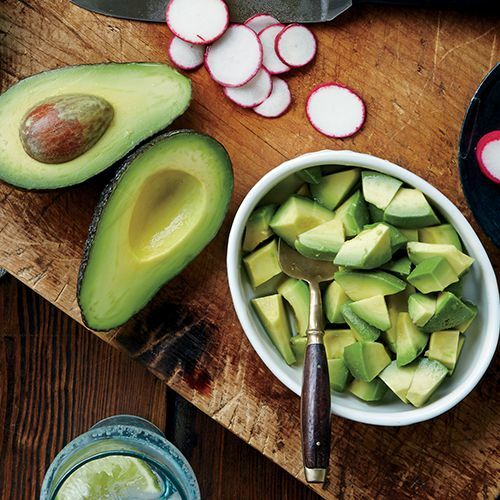 Since cut and exposed avocados tend to discolor quickly, experts advise you to add cubed or sliced avocado to your dish as late as possible in the preparation process. Adding a dash of lemon or lime juice to fresh guacamole should help prevent discoloration. Perfect Recipe: Sunny-side-up eggs, fresh sprouts, and salsa amp up Avocado Toast for a fast, no-fuss meal. 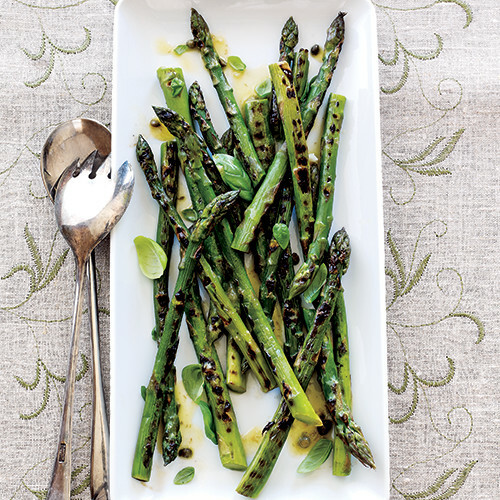 Season: Look for asparagus in the market from February to June, with April being the peak. Choosing: Fresh asparagus will be bright green with no signs of shriveling. The tender tips may have a purplish cast, but they should be firm and tight, never mushy. Storing: To keep asparagus in prime condition, trim the cut ends, stand them in a glass of water, cover with plastic, and refrigerate (glass and all) for up to two days. Health benefits: Eating this tender veggie is an excellent way to help protect yourself against heart disease, as it contains lots of folate, as well vitamins E, A, and C. In addition to helping your heart, folate (a B vitamin) helps cells regenerate; vitamin E fights Type II diabetes; and vitamins A and C help hold cancer and cataracts at bay. Asparagus also contains potassium, which helps lower blood pressure and perhaps even cholesterol. Perfect Recipe: Give this seasonal veg an extra boost of flavor this season by whipping up this Grilled Shrimp Skewers with Charred Asparagus and Snap Peas. 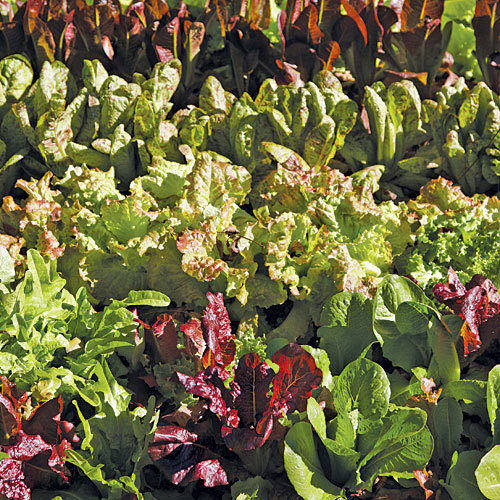 Season: Although available all year, spring and fall are peak season for endive, radicchio, and lettuces of all types. Choosing: Look for unblemished foliage that is not wilted, avoiding bunches with brown or wilted leaves. Storing: Store salad greens in a produce bag, and place in the vegetable bin of your refrigerator for up to five days. Health benefits: Incorporating healthy greens into your diet is an excellent way to spice up a meal, as well as a great way to get more calcium, folate, and vitamins A, K, and C.
Perfect Recipe: Featuring a mix of iceberg and romaine, hard-boiled eggs, quinoa, corn, and more, this California Crunch Salad makes a colorful, tasty, and satisfying main dish. Add a hint of lime by using Simply Dressed® Avocado Ranch in place of the suggested dressing. Season: Available all year, but seasons vary around the country. 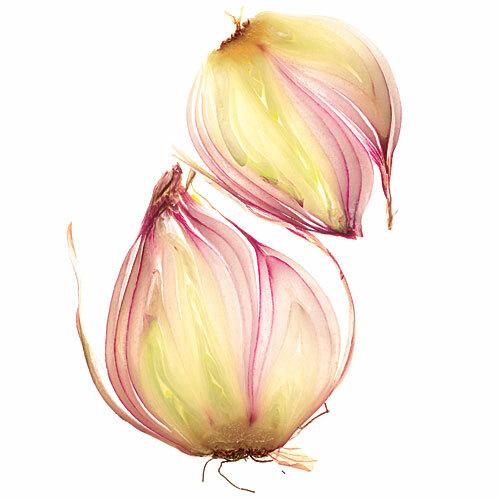 You'll usually find fresh onions in spring and summer, identified by their thin layer of papery skin. Choosing: Look for onions that are heavy and firm with tight, dry skins and no bruises, signs of sprouting, or smell (they release their fragrance when bruised or cut). Storing: Store in a cool, dry, dark place with lots of air circulating. Never suffocate them in plastic bags—they'll rot. Storage onions can last months; fresh ones, 30 to 90 days. Health benefits:Onions contain a decent amount of vitamin C and other trace minerals. Perfect Recipe: The earthy flavor of this Onion Tart, with touches of feta tang, pairs beautifully with a peppery, nutty salad for a complete and filling meal. Season: Available year-round in supermarkets, they're at their peak in spring. Choosing: When purchasing, look for plump, firm roots, preferably with the leaves still attached. Wilted leaves are a sure sign of mealy radishes below. Storing: When you bring radishes into the kitchen from the market or garden, chop off the greens—if they remain attached, they'll pull moisture from the crisp root. Store the radish roots in a produce bag in your crisper drawer for up to a week. If the radishes become spongy, crisp them by placing them in a bowl of ice water for up to an hour. Growing: Radishes are the ideal introduction-to-gardening crop. They have a short growing time, ideal for children whose attention spans may not last long enough for some vegetables to mature. The cool months of spring and fall are the ideal times to plant. 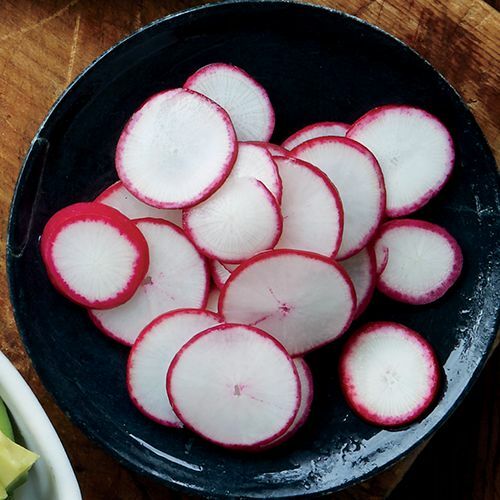 Perfect Recipe: With its peppery taste and crunchy texture, radish is the perfect addition to your toast this season. Try it on our Radish and Arugula Crostini with Brie. Season: Garlic is harvested in spring and summer, but it also stores well. Fresh garlic should be available year-round. 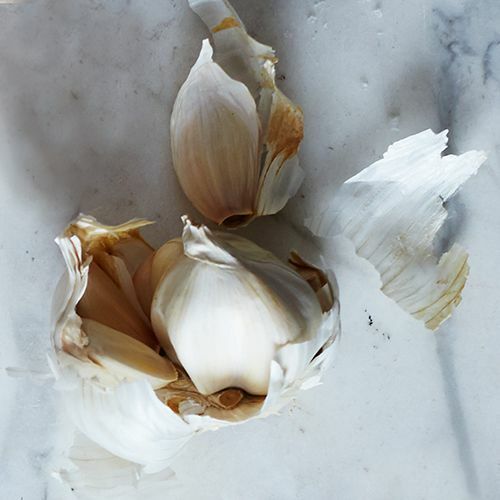 Choosing: Fresh, sweet garlic is plump, firm, and heavy. If the papery covering pushes in, the cloves have shrunken. Avoid garlic heads that have green shoots. Storing: Garlic will remain plump and usable on your countertop for a couple of months, but if you put it in your refrigerator, it will wait patiently for up to seven months for you to grab it and make a good recipe great. Perfect Recipe: It doesn't get much more garlicky than this glorious Slow Cooker Chicken with 40 Cloves of Garlic. Choosing: Look for bright red, firm berries that have bright green caps and are free of mushy spots. Storing: Leave the caps attached until you're ready to eat the berries. Refrigerate unwashed berries as soon as you bring them home. Place the entire container in a produce bag to prevent drying. Perfect Recipe: This Strawberry-Chicken Salad with Pecans features juicy strawberries at their seasonal peak. Season: You can buy grapes year-round, although the North American versions (mostly from California) are only available from July to December. Choosing: Select grapes that are plump, full-colored, and firmly attached to their stems. 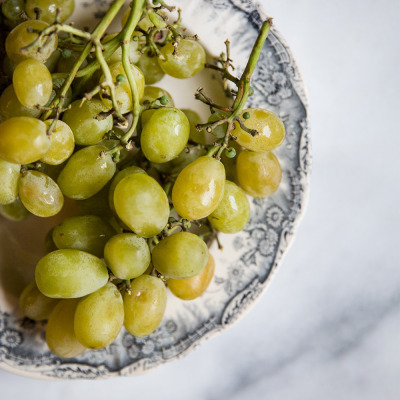 Look for a slight pale-yellow hue on green grapes, while red grapes should be deeply colored with no sign of green. Storing: Unwashed grapes can be stored in a plastic bag in the refrigerator for up to a week, although their quality diminishes the longer you keep them. The Perfect Recipe: Roasting the grapes mellows the tartness, deepens the flavor, and intensifies the sweetness of fresh grapes in this Chicken and Roasted Grape Salad. The Perfect Recipe: Turn "jacket potatoes" into these picnic-perfect Lemon-Caper Parmesan Potato Salad Bites.